Sometimes when I’m calling (especially One Night Stands), I want to go onto the floor to demonstrate. But then, I’m too far away from SquareDesk to be able to control the music. That’s where a Bluetooth Remote Control comes in! 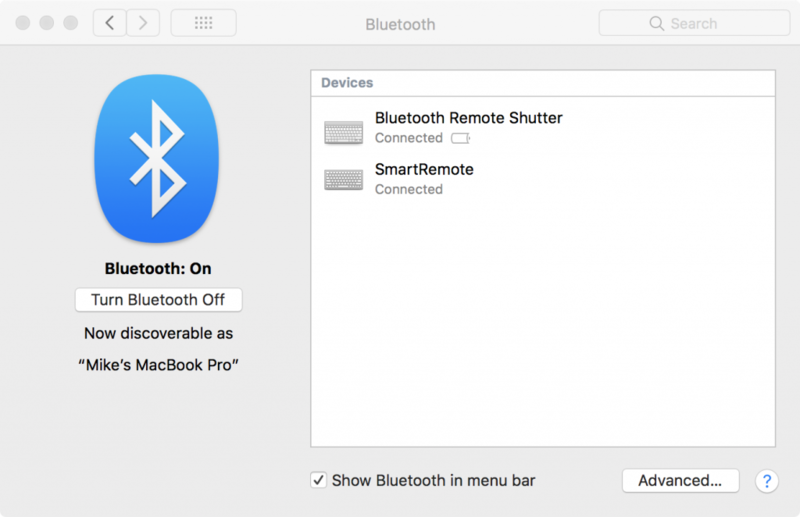 This tip might be useful for other callers not using SquareDesk on Mac OS X — the process should be similar with other applications, and with other operating systems. 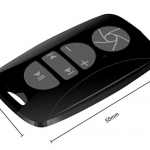 Of the two remotes, the Fintie remote is rechargeable via a Micro B USB connector. The BT Remote Control Button is not rechargeable, nor is the battery replaceable, but the manual says it should last about 2 years. The Fintie comes with keychain loop, while the Button comes with a double-sided sticky circle, which can be used to attach it to your equipment or wherever you prefer. I prefer the Fintie on my keychain, but it is a bit more expensive. Follow the instructions that came with the BT remote to pair it to your laptop. You’ll only have to do this once. 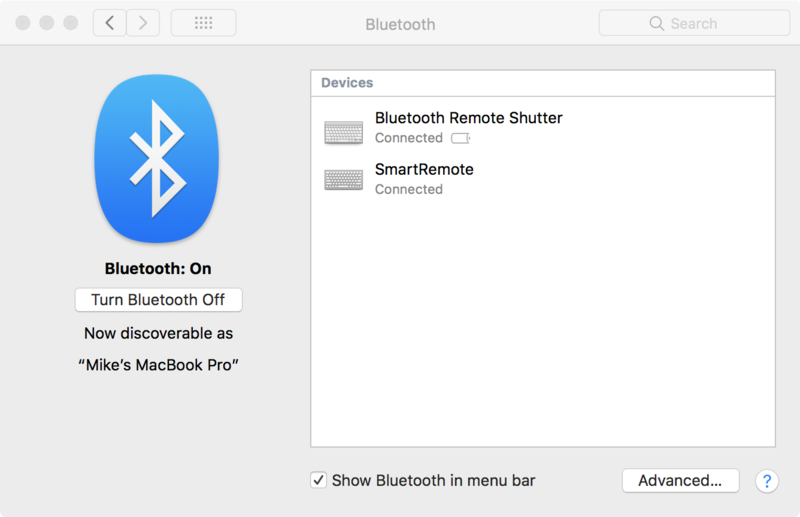 In this screenshot, I’ve paired both of these remotes to my Mac laptop. 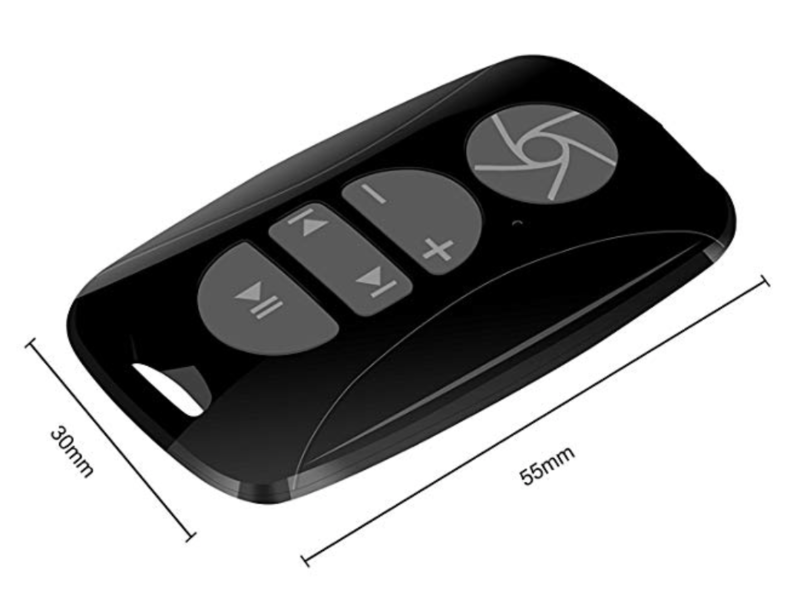 “Bluetooth Remote Shutter” is the Fintie, and “SmartRemote” is the Bluetooth Button. 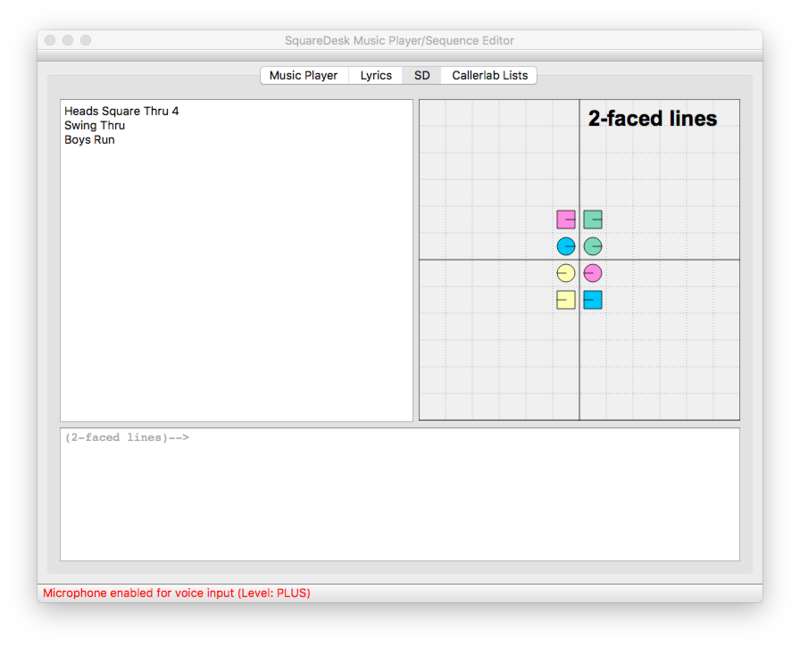 In SquareDesk (version 0.9.2alpha7 or later — let me know if you would like access to the Alpha version via Dropbox! 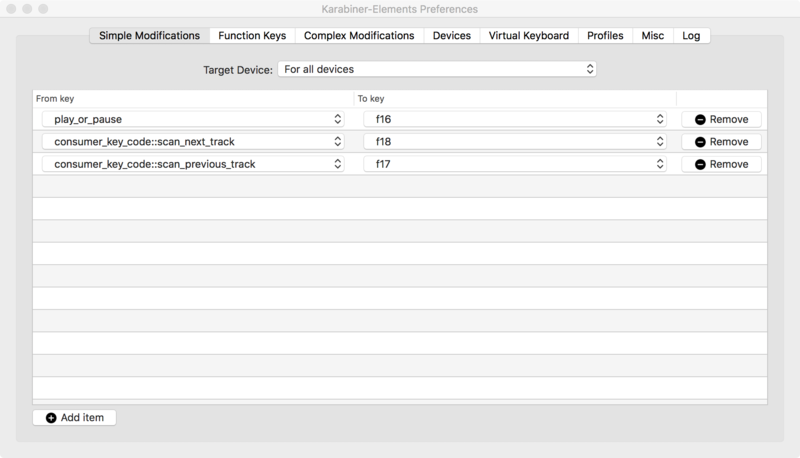 ), go to Preferences > Hotkeys, and configure as shown. Note that the F16/F17/F18 can go in any of the columns, it doesn’t matter which one. Just make sure that F16 is in the Play/Pause row, etc. When you’re done, click OK to close the Preferences dialog. Test it out! 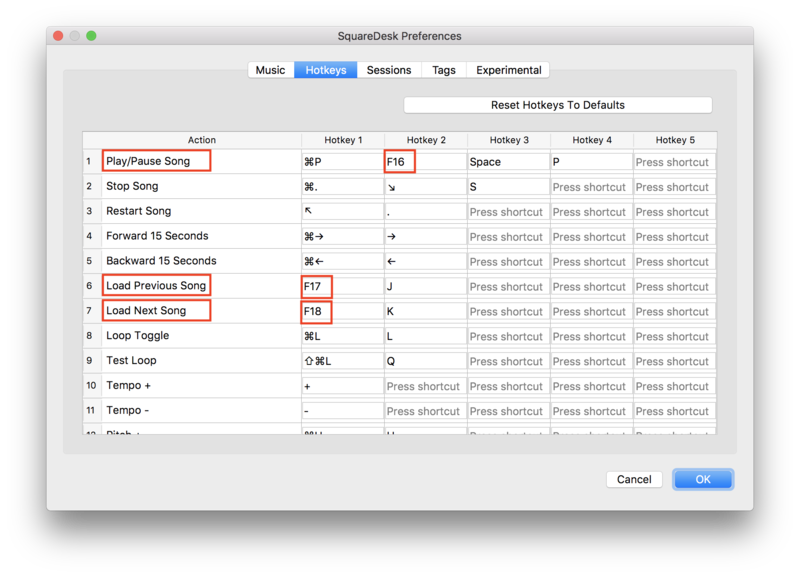 When you press a remote button, it’s just like pressing a key (like F16) on the keyboard, and you’ve setup SquareDesk to understand that F16 means Play/Pause.Try playing some music, and test all the buttons. Note: the “previous button” will go to the beginning of the song, if you aren’t there already, and a second press will take you to the previous song (this is the same way iTunes works). + and – buttons will adjust your Mac’s system volume (which should be fine, because we want to change the Volume for all songs, rather than just for this song). And, the Play/Pause button should, well, play and pause the music.The shutter button on the Fintie only does Volume Up, as it true of some other BT remotes, so I don’t use the shutter button. Give it a try and let me know if you found this useful! 0.9.2 alpha 7 now available in Dropbox! If you would like to get access to the Dropbox folder we use for distributing the Alpha versions, send email to “mpogue at zenstar studio dot com” (replace “at” with @ and “dot” with “.” and delete all the spaces) with your email address! If you want something a little more stable than the alpha 7 version, scroll down to the download links for Beta 0.9.1 below. Alpha releases are a little more “bleeding edge” than Beta version. If you would like to get access to the Dropbox folder we use for distributing the Alpha versions, send email to “mpogue at zenstar studio dot com” (replace “at” with @ and “dot” with “.” and delete all the spaces) with your email address! The Alpha 0.9.2alpha6 version seems fairly stable so far (but it’s not quite as fully tested as the Beta versions). If you want something a little more stable, scroll down to the download links for Beta 0.9.1 below. Newest cool feature in 0.9.2: support for tags! Set up some tags in the Preferences > Tags tab, and then right-click on a song to apply that tag. Search for tags by typing in the Title search box. I have tags for “Irish”, “HOT”, “Swing”, etc. Good stuff! There’s a new Beta version available for download! This is still a Beta release, so it’s likely to have bugs, and some of the features are incomplete. If you find any bugs, please let us know! Mac OS X users: I have not paid Apple for a Developer Certificate, so when you try to run the application itself, you might get a warning dialog. Here’s how to open the application anyway. You’ll only need to do this once. Windows users: I have not paid Microsoft for a Developer Certificate, so when you try to run the installer you might get a warning: “SquareDeskPlayer… is not commonly downloaded, and could harm your computer”. You can just click “Run” here to go on. If you get a second warning “Windows Defender SmartScreen prevented an unrecognized app from starting. This might put your PC at risk.”, you can click “Run Anyway”, then it should run the SquareDeskPlayer installer correctly. Open Beta Test: SquareDeskPlayer V0.8.1 (Mac/Win) is now available! SquareDeskPlayer is a fully-featured music player, designed for square dance callers and round dance cuers. SquareDeskPlayer contains a powerful MP3 player with independent pitch and speed controls, a quick-search facility, and a 3-band equalizer. 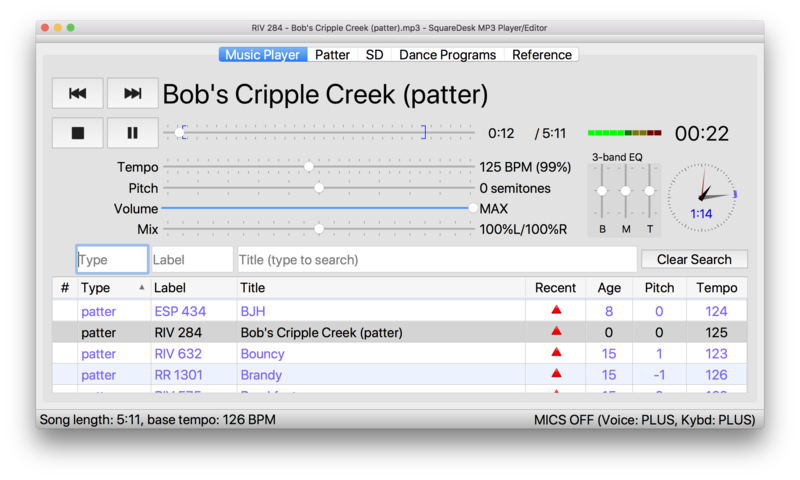 Version 0.7.1 adds a built-in version of “sd”, one of the best square dance sequence designers available, adding both a birds-eye graphical view of the square (all platforms) and easy voice input (Mac OS X only). 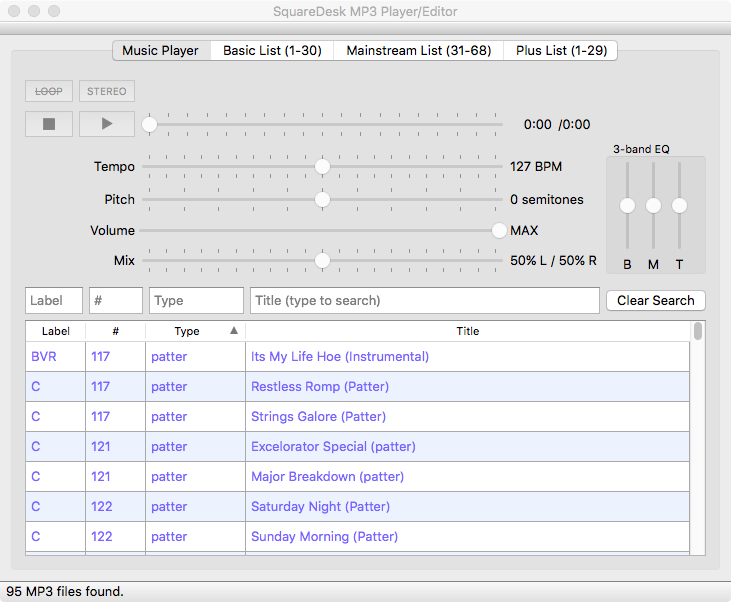 SquareDeskPlayer is native on Mac OS X, Windows, and (soon) Linux, so it’s fast and responsive. No need to buy virtual Windows software (e.g. Parallels, VMWare) or Windows compatibility layers (e.g. CrossOver) for your Mac. SquareDeskPlayer is also free (as in beer), and source code is available under standard Open Source licenses (GPL2/3), so programmers can customize or extend anything in the application. Here’s a quick PDF introduction to SquareDeskPlayer. And, here’s a short Youtube video of SquareDeskPlayer’s speech recognition in action. 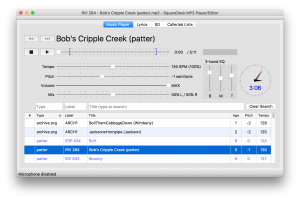 SquareDeskPlayer is the newest version of SquareDesk, a fully-featured music player (and eventually lyrics editor), designed for square dance callers and round dance cuers. 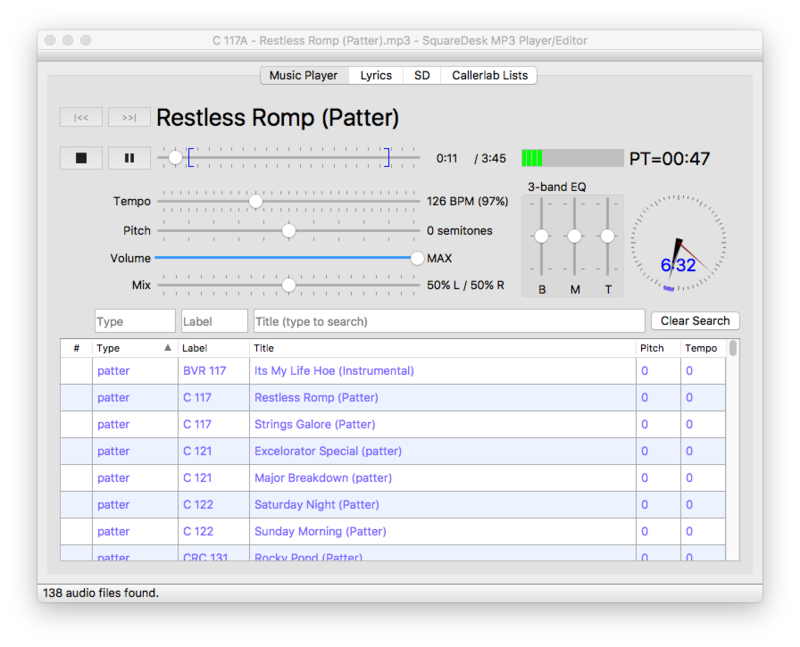 SquareDeskPlayer contains a powerful MP3 player with independent pitch and speed controls, a quick-search facility, and a 3-band equalizer. It will eventually be merged with the MP3 Lyrics Editor shown below, which will provide singing call lyrics (and round dance cues) editing, karaoke-like dynamic highlighting, and more. Once I reach the V1.0 milestone, the code will be released as Open Source under a suitable license, so that others can develop new features as well. Here’s a quick PDF introduction to SquareDeskPlayer. 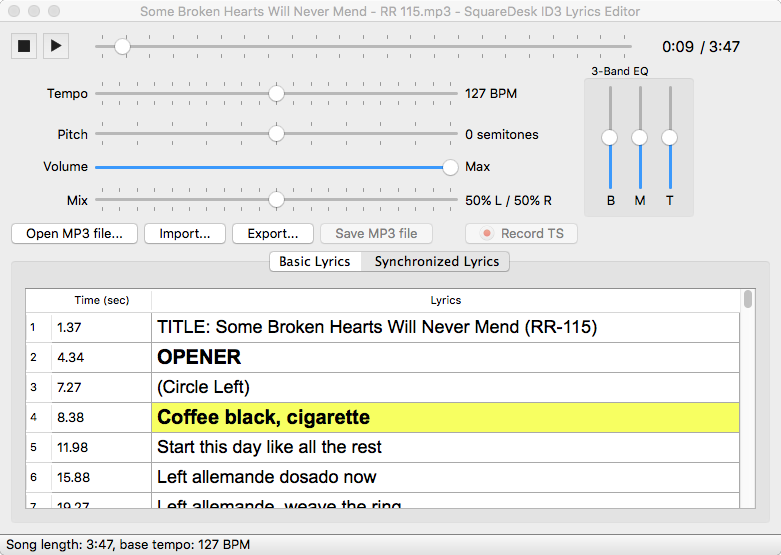 SquareDesk helps square dance callers manage their music and lyrics. It is both a singing call lyrics editor, and a synchronized lyrics/MP3 player. 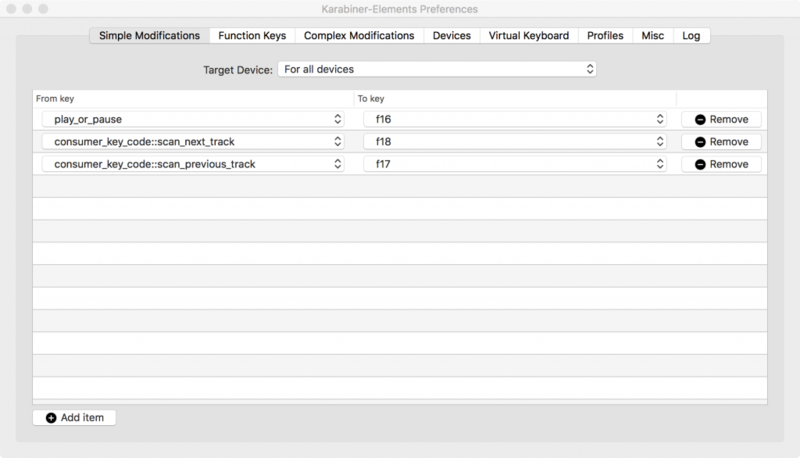 Version 1.0 will be available soon, for PC and Mac OS X, with later support for iOS and Android tablets.